It’s been quite a turbulent week in Virginia politics. What started as a disastrous revelation about the Democrat party and its full-throated support for late term abortions ended with a singular focus on Governor Ralph Northam and whether he will have to resign over what has to be the worst yearbook photo choice in history. The news of Gov. Northam dressing in either blackface or a Klan hood while in medical school has captured the attention of every media outlet across the country. The Washington Post has reported that Northam got to choose which photos appeared on his yearbook page. CNN has been running this story at the top of the hour, asking all their guests whether Northam should resign or not. Do you know what they are not talking about? Democrats and their support for abortion up until the moment of birth…and even later. It’s no coincidence this story appeared when it did. Before this story, we were talking about Kathy Tran’s admission that her bill would make it easier for a woman to have an abortion, even if she had gone into labor. Now we are wondering whether Northam was in blackface or a Klan hood. Before this story we were talking about Ralph Northam’s radio interview where he admitted that an abortionist would deliver a full term healthy baby, then have a “discussion” with the mother about whether the baby would live or die. Now we are talking about whether Northam will resign over this photo. Before this story we were talking about the Democrat’s press conference defending their support of Kathy Tran’s bill by admitting that abortion on demand up until the moment of birth IS ALREADY LEGAL IN VIRGINIA (as if that is supposed to somehow make things better), and Tran’s bill simply makes it easier for that to happen. Now we are wondering which Republican dropped the ball by not finding this photo earlier. What used to be a national conversation about an issue that is unfavorable for all Democrats nationwide has shifted to a discussion about one single Democrat, and it was done on purpose. Ralph Northam’s career is being sacrificed in an attempt to stave off a politically dangerous conversation about late term abortion because Democrats are afraid the average voter might find out about their extreme social agenda. After all, Virginia is not the only place where this type of radical, anti-life agenda is being pushed. The state of New York just recently passed the very same type of legislation and Democrats in Virginia have vowed to bring Kathy Tran’s bill back next year. Is a 34 year old photo more important than the thousands of babies that are murdered in third trimester abortions every year? 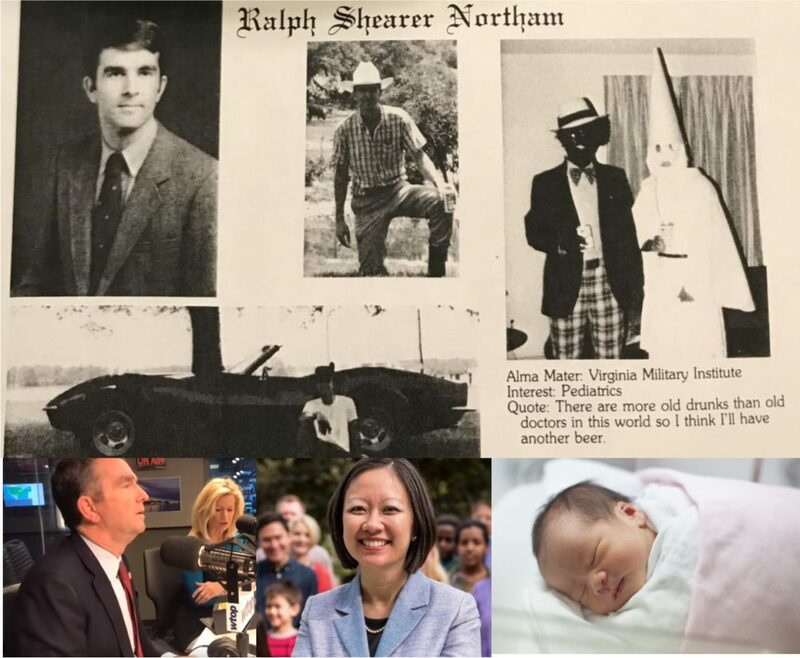 Is Northam’s medical school yearbook photo choice more important than Democrats pushing to make it easier to allow a single abortionist to deliver a viable, healthy baby alive, then murder it? For the record, I think dressing in either costume and posing for that photo shows incredibly poor judgement. I think Ralph Northam is most likely in that photo, and that it was both insensitive and offensive. But I don’t think the Republican party should be dragged into the debate about whether he should resign or not. Northam is the Democrat’s problem. If they want to turn on him and try to throw him out of office, they are free to do so. If Republicans get drawn into this debate, we allow the distraction to work and let the Democrat party as a whole off the hook. All 140 members of the General Assembly are up for re-election this November, with statewide redistricting on the line. Every single Democrat incumbent and challenger needs to be held to account for the extreme, radical agenda that has taken over their party. Every single one of them needs to be asked whether they support the killing of a healthy human baby at the moment of its birth. We cannot let them wriggle out of this debate with this blatant attempt to change the subject. If you want to help send the message that you care about the lives of unborn children, there will be a pro-life rally this Thursday, Feb. 7th at 10:00 AM at the Virginia Capitol in Richmond. Join your voice to an organically growing chorus of support for the right to life that is getting larger by the hour.